AMD FX-8350 and FX-6350 CPUs now have a quieter cooler as part of the package. AMD is bringing its Wraith cooler to more CPUs in hopes that lower temperatures and quieter operations will sweeten the deal. The Wraith cooler is now bundled with AMD FX-8350 ($180) and FX-6350 ($130) processors. It’s already available on AMD’s FX-8370 CPU ($200) and A10-7890K APU ($170). 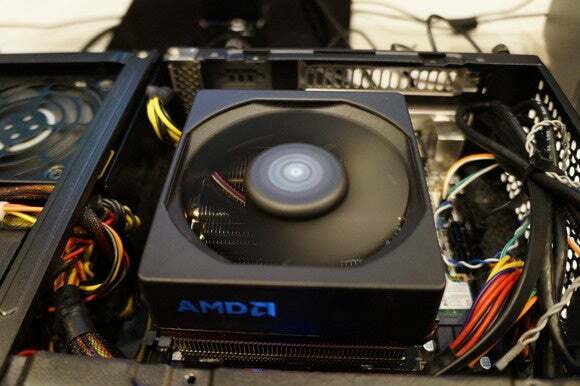 AMD first introduced the Wraith cooler during the CES trade show in January. Wraith promises to be much quieter than AMD’s typical coolers. Its fan also operates continuously at low speed, which should be less distracting than a fan that keeps switching on and off. Keep in mind that AMD FX-8350 and FX-6350 processors are already on the market without the Wraith cooler, and for now retailers are continuing to sell the old models. The new CPUs that include the Wraith cooler are specifically marked as such on the box. Why this matters: While stock coolers aren’t usually praiseworthy—and are often replaced by anyone looking to overclock their machines—the Wraith cooler is noticeably quieter than the ones that have previously shipped on AMD processors. Consider it a pleasant add-in for users who aren’t dead-set on aftermarket solutions.